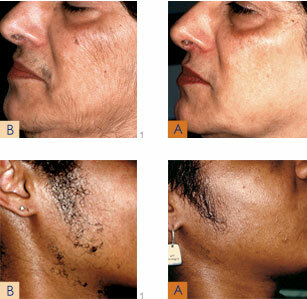 The latest in Laser Hair Removal technology today is available in Windsor, Ontario’s own Coral Medical Health Spa. By having both IPL Hair Removal and Laser Hair Removal we strive to offer safe, effective and results based Hair Removal treatments to ensure that excess body & facial hair is gone quickly without coming back. We use the Apogee Elite Laser technology, the first and only Hair Removal Machine to offer two types of laser wavelengths (Alexandrite and ND YAG). By providing two different wavelengths, the Apogee Elite laser can be used to treat patients with all types of skin. The addition of the YAG laser allows us to treat patients of darker skin types for excessive hair growth, especially on the face, underarms and bikini lines. We can also treat patients struggling with razor bumps on the neck & beard in addition to large body areas like the legs & back. 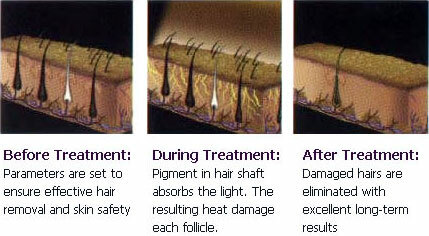 The Apogee Elite laser for hair removal affects only hair follicles which are currently active or growing (anagen stage of growth), therefore more than one treatment is required to eliminate the other stages of hair growth (catagen & telogen) as these hair follicles resume their active growth cycle. Hair removal treatments are relatively painless and leave no textural skin changes or the scarring commonly seen with needle electrolysis. All of our top Cosmetic Treatments, including Laser Hair Removal treatments are all performed by trained and certified technicians. In addition the Laser Hair Removal protocols used are physician-approved and supervised, ensuring patient safety and satisfaction. Laser hair removal is carried out by qualified technicians who are specially trained and highly experienced in Laser hair removal treatments. Hair Removal Pricing in Windsor – Starting at only $44 per treatment depending on the area. After the initial six treatments pricing changes to reflect maintenance treatments where pricing begins at $24 per treatment or up to 70% off of the initial treatment price. Please inquire within for additional details. Please call to schedule a consultation with one of our Laser Hair Removal specialists and ask about our pricing and package specials.